And I just know this is what it will look like. Seriously, the purpose of the consult is to determine if I’m a good candidate for surgery. Seems they won’t do it unless I have the right attitude and frame of mind to make it work. I’m actually looking forward to this, but I’m nervous at the same time. I’ve been thinking I should seek out a professional for some time, because I know that I have issues. I’m hoping that a session will be a good beginning, something that I can build on and get better. I have no doubt that I have issues. I think everyone has issues of some kind, in some cases buried deep, in others, right on a sleeve. It’s finding the issues, confronting them, and reaching a peace that’s important. I’ll let you know how it goes… so please keep good thoughts for me. Today’s post is about stress. Pretty straightforward thing, stress. Apply too much to anything and it will break. Stress affects different people differently. Some people thrive on it. Some grit their teeth and handle it. Some have a breakdown. Others cope in different ways. For me, I stress eat. See, I’ve never been really good at letting go of things. Just ask The Management. She notices how little things can just linger. Take for example, Volleyball Corner. Volleyball Corner is a small store on Lincoln Highway. It’s located near Lancaster Mennonite School, and well, it drives me nuts because IT’S NOT ON A FREAKIN’ CORNER!!!!! It’s in the middle of a *^#%&^ building!!! The only corner would be the actual corners inside the store itself. Compare this to Angelo’s Soccer Corner, which is located on the corner of the building. Is there any real reason this should bother me? No. It’s stupid to let this get under my skin, but for some reason I can’t seem to let it go. We’ve all heard that famous Friedrich Nietzsche quote. I disagree. Stress is cumulative. Take a piece of thin metal. Keep bending it back and forth. It won’t break the first or second time you bend it, but continued bending will break the metal, sure as shooting. You can argue that people aren’t metal, but I’m willing to bet that continued stress puts wear and tear on your body that it’s not always equipped to handle. 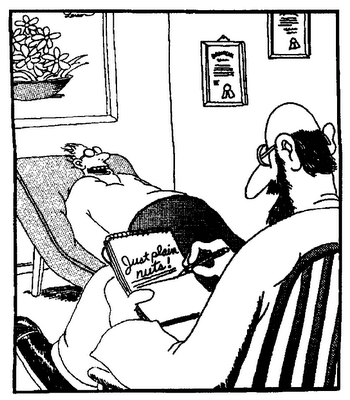 This is one reason I’m really looking forward to my appointment with the psychologist on the bariatric team. I’m hoping to get some insight on what I can do about my little stressors. Maybe I’ll eventually learn to deal with my irrational fear of clowns. At the very least, I hope to learn some ways to avoid keeping it all bottled up. It’s not healthy and I know it’s a big contributor to being obese and diabetic. Have a great holiday weekend… The Management and I will be joining some of the Disney peeps tomorrow for a picnic. Will be nice to see everyone.